American Idol judges Katy Perry, Lionel Richie and Luke Bryan eliminated three contestants from the Top 20 after the remaining 10 hopefuls took the stage and performed duets with celebrity singers. 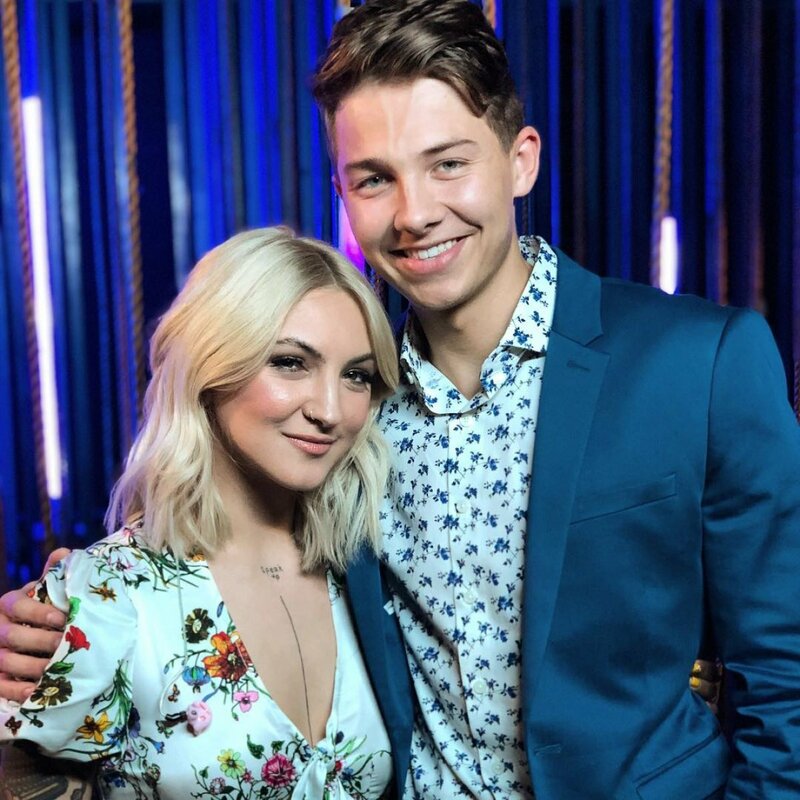 The second round of 10 singers from the Top 20 performed duets on Monday night with some of the best singers in the music industry. The episode was hosted by American Idol's in-house mentor, Bobby Bones, as Ryan Seacrest had to miss his first show in 17 seasons due to illness. After a night of excellent performances, the American idol judges made the very difficult decision to eliminate Ryan Hammond, Logan Johnson and Raquel Trinidad from the Season 17 competition, sending the other seven artists to the Top 14. The Top 14 finalists now include Evelyn Cormier, Dimitrius Graham, Jeremiah Lloyd Haron, Alyssa Raghu, Wade Cota, Eddie Island and Alejandro Aranda. The first celebrity duet of the night featured Alyssa, a 16-year-old high school student from Orlando, FL -- who made the Top 24 last year but then got cut -- and Julia Michaels singing "Issues." Katy said the singers fed off each other well and she executed some alternative melodies that were "so good." Luke noted Alyssa allowed the song to do the work and he was impressed with how she performed the difficult vocals. And Lionel complimented her on continuing to grow and develop. She appeared confident and comfortable onstage. Eddie, a 25-year-old rideshare driver from Nashville, TN, performed "7 Years" with Lukas Graham. Luke thought Eddie did a great job and he complemented Lukas well. Lionel explained Eddie has managed to make every performance of his this season seem like he was having the time of his life. He also appreciated Eddie showing off his range and added he's "no joke" now. Katy told Eddie that his energy is "infectious" and she always finds herself on a different planet when he performs. "You always let me escape a little bit," Katy said. Wade, a 27-year-old musician from Phoenix, AZ, belted out "Broken" by Lovelytheband. Lionel said Wade has "a voice to be reckoned with" because it's "so powerful." He was glad to see Wade feeling comfortable in his own skin and said he's "going places." "You are turning into a real bonafide rock star," Katy said, adding that he looked great dancing onstage and doing a little choreography. "You've really tapped into some other worldly energy." Luke noted Wade had blossomed right before the judges' eyes and he pulled them into the performance. Ryan H., a 25-year-old medication technician from Modesto, CA, then took the stage with Cynthia Erivo, and the pair sang a duet of "Hold On, I'm Coming." Katy said she felt like she was at church and Ryan really held his own in the performance. Katy, however, could tell Ryan needed to connect a little more with the song and "get more into it." Luke agreed Ryan needed to "add a little more swagger" to his performance, but Lionel was impressed and applauded him. "Your voice is on its way to stardom, but just relax and ride," Lionel suggested. Next up was Evelyn, a 19-year-old teacher from Claremont, NH, and Chris Isaak with "Wicked Game." Luke said he had a front row seat "to a very special moment" and he loved the undertones in her voice. Lionel called Evelyn "a stylist" just like Chris, and then Katy gushed about her being so sophisticated, sultry and intimate during the performance. "It was just so beautiful. I believed every word you were singing. It's an 'It' factor you can't learn or buy, and you've just got it," Katy told the artist. Logan, a 20-year-old golf shop attendant from Boise, ID, then sang "What a Time" with Julia Michaels. Lionel thought Logan did a great job of listening and trying to match Julia. Katy said she was hanging on Logan's every word and there was "a star on the stage." But Luke advised Logan to push his vocals a little more and work on them, even though it was a "solid" duet. Raquel, a 21-year-old server from Tampa, FL, was up next, and she took the stage with Lovelytheband for "Tiny Dancer." Katy said she's never heard Raquel sing that well and she should continue to bring out the tricks up her sleeves. Lionel wanted Raquel to look at and engage the audience more, but the judges were excited about her "recognizable" voice. Luke also said she showed everyone "a new dimension" to her voice. Alejandro, a 24-year-old dishwasher from Pomona, CA, performed "There Will Be a Light" by Ben Harper. The guys basically had an intimate jam session on the stage for all to witness. Luke said Alejandro's approach is "tasteful" and she loves his character -- a "quiet, gentle person." Lionel gave Alejandro props for taming the wild, unruly crowd, and he added Alejandro's combination of his voice and guitar skills is "lethal." "Even if it's done here on American Idol, no matter where you land, I guarantee you have a career," Lionel told the singer. Katy appreciated Alejandro's authenticity, sensitivity and how nothing can change him. Viewers then watched Dimitrius, a 27-year-old retail associate from Baltimore, MD, sing with Lukas. The guys chose "Love Someone" for their duet. Lionel thought the duet was "perfectly executed" and they were both "so in control." "I'm going to go as far as to say that was the best-sounding duet I've heard today," Katy told Dimitrius, adding that he had clearly taken the judges' advice and his performance was "perfect." Luke gushed about how Dimitrius is one of the best singers he's ever heard, and then Katy quickly added, "He's the male Beyonce!" For the final performance of the night, Jeremiah, a 26-year-old music teacher from Catonsville, MD, performed "Time After Time" with Cynthia Erivo. Katy said it was as if Jeremiah and Cynthia's souls were singing to each other. She found Jeremiah's performance mature and noted he's "timeless" and has "crazy range." Luke said he wished he had roses to throw on the stage and called the performance "incredible." The judge also said he knocked his last huge note out of the park. "That was flawless," Lionel told Jeremiah. "We've just witnessed a masterful performance." The seven winners from Monday night's broadcast joined the seven contestants who had advanced on Sunday night: Laci Kaye Booth, Ashley Hess, Walker Burroughs, Madison Vandenburg, Uchechukwu "Uche" Ndubizu-Egwimis, Riley Thompson and Laine Hardy.